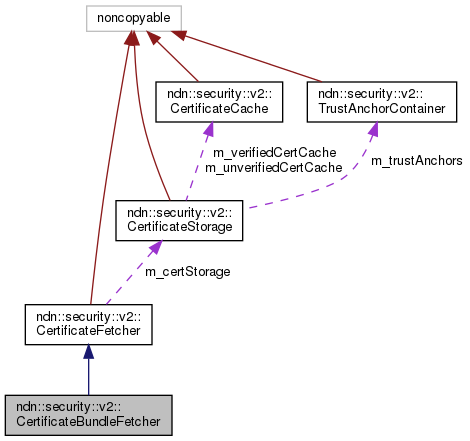 Fetch certificate bundle from the network. Currently bundle fetching is attempted only for Data validation. This may change in the future. Bundle fetching always goes to the infrastructure regardless of the inner fetcher. 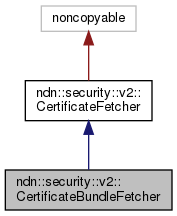 Inner fetcher is used when the bundle interest times out or returns a Nack or when additional certificates are needed for validation. Definition at line 41 of file certificate-bundle-fetcher.hpp. Definition at line 35 of file certificate-bundle-fetcher.cpp. Set the lifetime of certificate bundle interest. Definition at line 45 of file certificate-bundle-fetcher.cpp. Definition at line 51 of file certificate-bundle-fetcher.cpp. Set the storage for this and inner certificate fetcher. Definition at line 57 of file certificate-bundle-fetcher.cpp. Definition at line 64 of file certificate-bundle-fetcher.cpp. References ndn::Name::empty(), ndn::SimpleTag< T, TypeId >::get(), ndn::Name::get(), and ndn::name::Component::getSuccessor().